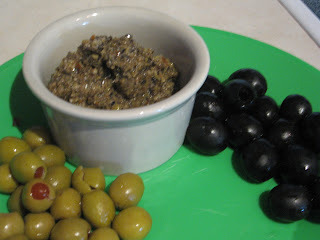 I found this black and green olive pesto recipe out this month's Taste of Home Magazine and knew we had to try it. My hubby is a huge fan of olives. He literally puts them on everything, so I knew he'd love this recipe. There's so many different uses for pesto that this, and any other recipe like it, is so versatile. You can easily toss this in with some pasta, or use it as a spread for sandwiches, or as a dip with bread or crackers. Tonight we stuffed our burgers with the pesto before throwing it on the grill! It was our first grill-out of the season and they were YUMMY. I caution you to be reserved in any salt or seasonings you might want to use when serving the pesto. The green olives alone can be high in salt/sodium content, so you really don't need much else. Combine all ingredients in a food processor and chop them very fine. Use on pasta, on sandwiches, as an appetizer, or to stuff or slather on meat! I apologize for the lack of posts this month so far. I've been on vacay in FL visiting my family for the past week and have a few days left here until I head back to my end of the country. But my mom made a wicked awesome breakfast dish the other day that I just HAD to share with you all. She came across this recipe years ago in some magazine (that she can't remember), and made it a long time ago. Somehow I missed out on its goodness at that time, but am so glad I got to partake in the deliciousness this week! Go with me on this. When I first heard the ingredients I thought "Ew. That sounds really weird together." But trust me, it's FAB. If you want a super easy breakfast dish to prepare, that makes you look like a super fancy chef that everyone will be envious of, make this. In a small bowl, blend sour cream and brown sugar; chill. Place 6 french toast slices in bottom of greased 13 x 9 inch baking pan. Layer ham, 1 1/2 cups cheese and remaining 6 slices of french toast. 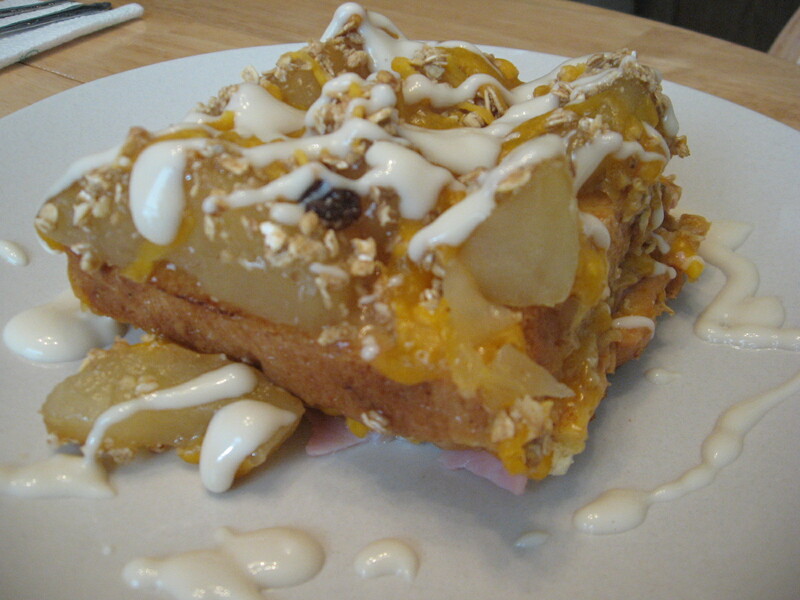 Spread apple filling over top; sprinkle with granola. Bake at 350 degrees for 25 minutes. Top with remaining 1/2 cup cheese and bake for 5 minutes more or until cheese is melted. Drizzle sour cream and sugar mixture on top. Yields 6 servings. Want the same great taste and flavor of chicken chow mein only with half the carb load? Here's a great hot dish for you! I'm revisiting my hot dish cookbook that I wrote about in a few previous entries. My mom recommended that I try the Chicken Chow Mein in there and we decided to give it a go for lunch this afternoon. I made a few adjustments of my own and I have to say, it was REALLY fantastic! This is chow mein without the noodles or rice, but oh so good! My hubby couldn't stop raving about it. In a saucepan, stir and cook onions and celery in butter until tender. Stir in soup, chicken broth, and soy sauce. Add chicken and mushrooms; stir and cook until hot. Pour mixture into a greased 2-quart baking dish. 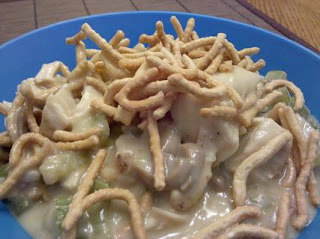 Sprinkle with chow mein noodles and cashews. Bake at 350 uncovered until bubbly hot, about 25 minutes. Serves 4.